That phrase, written many years ago by the fabulous turf writer Charles Hatton, came to mind when I happened to notice that No. 1, No. 2, No. 3 and No. 4 on my Kentucky Derby Top 10 list this week are all undefeated…so far. Maximus Mischief went into last Saturday’s Grade II Holy Bull Stakes at Gulfstream Park with, yes, an aura of invincibility. But after the race, he no longer has an unblemished record. Sent away as a 4-5 favorite after winning his first three career starts by a combined 17 lengths, Maximus Mischief finished third in the 1 1/16-mile Holy Bull. Harvey Wallbanger rallied from far back in the field of nine to prevail by one length. Let’s just say that Harvey Wallbanger was far from making any trees sway in the Holy Bull. The final time was 1:43.69. Harvey Wallbanger was dismissed in the wagering at 29-1. Another Hattonism: Harvey Wallbanger paid a “rags to riches” $61.20 to win. Maximus Mischief, trained by Butch Reid, did get washy before the Holy Bull. It also was the Into Mischief colt’s first race since winning Aqueduct’s Grade II Remsen Stakes by 2 1/4 lengths at 1 1/8 miles on Dec. 1. The “next spot” for Maximus Mischief, according to Reid, will be Gulfstream’s Grade II Fountain of Youth Stakes at 1 1/16 miles on March 2. It’s not as if Maximus Mischief lost the Holy Bull by a lot. He finished only 1 1/2 lengths behind the winner. But the Holy Bull was not a strong race from a Beyer Speed Figure perspective. Harvey Wallbanger was credited with a modest 85 Beyer. Maximus Mischief recorded a career-worst 83 after figures of 94 in his career debut, 98 in his second start and 97 in the Remsen. I made the decision to drop Maximus Mischief all the way out of the Top 10 this week after he was No. 4 last week. One of the main reasons for doing this is he failed to get the job done the first time he really did not get it pretty much all his own way. But Maximus Mischief does have the opportunity to earn his way back onto the Top 10 if he can regain his winning ways in the Fountain of Youth. One aspect to the result of the Holy Bull is I see it as a boost to Signalman. Ken McPeek trains both Signalman and Harvey Wallbanger. At this point, I think Signalman is the better of the two, though it always must be kept in mind that things certainly can change dramatically during the first few months of the year as some 3-year-olds get better while others do not. Signalman finished a respectable third in the Grade I Breeders’ Cup Juvenile at Churchill last Nov. 2. That race was won by Game Winner, who is at the top of my Kentucky Derby Top 10. In Signalman’s final start at 2, he won the Grade II Kentucky Jockey Club Stakes on a sloppy strip Nov. 24 at Churchill Downs. McPeek recently said “he really liked” what he saw from Signalman on that occasion. 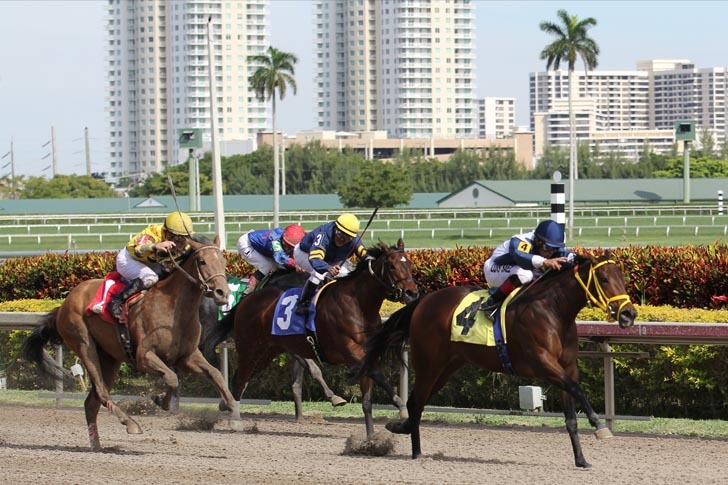 Signalman exhibited some of that zip last Saturday when he worked four furlongs in a near-bullet :46 3/5 at Gulfstream. McPeek said it was a mistake for the General Quarters colt to work that fast. An unwanted fast drill like that is not a catastrophe when it does not occur close to a race. Signalman is not scheduled to make his first 2019 start until early next month in the Fountain of Youth. Game Winner, trained by Hall of Famer Bob Baffert, worked five furlongs in 1:03.40 at Santa Anita last Wednesday. According to Baffert, the Candy Man colt is headed to Santa Anita’s Grade II San Felipe Stakes at 1 1/16 miles on March 9 for his 2019 debut. Game Winner was voted a 2018 Eclipse Award as champion 2-year-old male. Baffert also trains the undefeated Improbable, winner of the Street Sense Stakes at Churchill last Nov. 2 and Grade I Los Alamitos Futurity on Dec. 8 in his most recent start. The City Zip colt zipped five furlongs last Friday in a bullet :58.40 drill at Santa Anita. As for my current Kentucky Derby list, No. 1 Game Winner, No. 2 Improbable, No. 3 Instagrand and No. 4 Hidden Scroll all have that aforementioned “aura of invincibility” at this time. They are a combined 10 for 10. Game Winner is four for four. Improbable is three for three. Instagrand is two for two. Hidden Scroll is one for one. Another Baffert-trained 3-year-old, Mucho Gusto, moves up a notch this week to No. 8 after splish-splashing his way to a 4 3/4-length victory as the 3-5 favorite in Santa Anita’s Grade III Robert B. Lewis Stakes at 1 1/16 miles last Saturday. The Mucho Macho Man colt recorded a 90 Beyer Speed Figure. Mucho Gusto now has three wins from four lifetime starts. His Lewis triumph flattered Improbable. In Mucho Gusto’s only defeat, he finished second in the Los Al Futurity when no match for Improbable, with five lengths separating the pair at the end of that 1 1/16-mile race. Tax is among a plethora of 3-year-olds lurking below my Top 10. He won Aqueduct’s Grade III Withers Stakes at 1 1/8 miles last Saturday. Tax stumbled at the start, found himself briefly in claustrophobic quarters (yet another of Hatton’s phrases from time to time) in upper stretch and won by a small margin in a three-horse driving finish. Favored at 2-1, Tax completed his journey in 1:50.23. He recorded a commendable 96 Beyer Speed Figure. Not That Brady and Our Braintrust finished second and third, respectively. Not That Brady came out and bumped Our Braintrust three-sixteenths from the finish, then those two brushed each other a number of times the rest of the way. No change was made to the original order of finish after a stewards’ inquiry and an objection against Not That Brady lodged by the trainer of Our Braintrust, Mark Casse. Tax was making his 2019 debut in the Withers. In his final 2018 start, he finished third behind Maximus Mischief and Network Effect in the Remsen. New on my Top 10 this week is Omaha Beach, who found a cure for second-itis in a big way at Santa Anita last Saturday. The War Front colt, trained by Hall of Famer Richard Mandella, registered a resounding nine-length win in a seven-furlong maiden special weight race contested on a sloppy track. Omaha Beach’s final time was an excellent 1:21.02 after he carved out fractions of :21.75, :43.74 and 1:08.24. He posted a 90 Beyer to equal the figure earned by Mucho Gusto later in the card when he won the Lewis. Network Effect, who is in Florida with three-time Eclipse Award-winning trainer Chad Brown, exited my Top 10 last week due to the lack of a recent workout. He had not had a recorded workout since his five-furlong move in 1:01.80 on Jan. 13 at Palm Meadows. Network Effect very nearly moved back onto my Top 10 after he worked four furlongs Monday at Palm Meadows in :49.60. In his final start at 2, Network Effect ran second to Maximus Mischief in the Remsen. For me, even the word “myriad” has a Hatton connection. The first time I can remember seeing that word in print was when it had been used by Hatton in something he had written in the American Racing Manual. And like many words Charles Arthur Hatton used, I had to look it up. In a way, though my major at Eastern Washington University was journalism, what really expanded my vocabulary back then was all the reading I did as a serious student of the University of Hatton. Well, I have a couple of boxes filled with Racing Forms from the 1960s and 1970s, Racing Forms that I’ve saved specifically because Hatton’s columns are in them. Yes, I have every one of those American Racing Manuals from 1949 through 1974. Did you know that Hatton is recognized as being the person chiefly responsible for linking the three races that we now refer to as this country’s Triple Crown? In my high school days, it was a rarity when I did not read Hatton in the morning while eating breakfast. My mother does not drive. She never has. In those years whenever I drove my mother somewhere, I often asked (okay, I insisted) that she read Hatton aloud from an American Racing Manual. And I continued to soak up all the Hatton that I possibly could after I first started working for the Racing Form as a chart-caller and writer in the Pacific Northwest in 1974. One morning in the summer of 1975 in the publicity office at Playfair Race Course in Spokane, Wash., Jim Price asked me out of the blue if I was familiar with Hatton’s work. Price at that time was the track announcer and a fine writer in his own right as the track’s publicity director. I responded by saying that not only was I familiar with Hatton, I idolized him. “Riva Ridge won five of nine engagements last season, which is nice going for a handicapper, especially one who has problems and is unhappy in wet weather. He earned $212,602 and joined the sport’s millionaires with a total of $1,111,497. His stud potential was syndicated at $5,120,000. “We do not quote these facts for support, as a drunk uses a lamppost, but for illumination. At the height of his fascination and power, Riva Ridge was a brilliant entertainer, though he sometimes appeared frightfully irresponsible. I worked at Delta Downs as a chart-caller for the Racing Form in 1976, filling in for the vacationing Dave Wilson. One morning Hatton’s name came up in the racing office. Much like what had happened at Playfair the year before, Wilson suddenly had an American Racing Manual in his hands. Before he opened the book, Wilson said one of the finest things he had ever read in his entire life was what Hatton had written regarding Secretariat’s conformation as a 2-year-old. To a group of 10 or so that had gathered around Wilson in the racing office, he proceeded to read aloud what Hatton written about Secretariat. Born in New Albany, Ind., on May 20, 1905, Hatton often visited Churchill Downs as a youngster. Hatton once wrote that he was “playing hooky from school” when he witnessed Sotemia set the world record of 7:10 4/5 at Churchill in 1912. According to Goldberg, “Hatton’s strongest opinion” was in his hesitation to use the word “great.” It was a term “seasoned, discriminating turfmen rarely employ,” Hatton wrote in his profile of 1953 Horse of the Year Tom Fool. “Great is a term we seldom have occasion to employ. But this Derby was the greatest. The greatest of all its winners gave the greatest performance in its annals before the greatest audience ever when Secretariat reduced this ‘greatest two minutes in sports’ to 1:59 2/5. As for the epic 1973 Belmont Stakes, in one of my boxes filled with Hatton’s columns, I found a yellowed column the master of prose had written after Secretariat’s 31-length tour de force to become the first Triple Crown winner in 25 years. The headline: Horse of the Century. “BELMONT PARK, Elmont, N.Y. — From the tintype days of Old Rosebud, high buttoned shoes and livery stables, to the jet propelled present, one has seen a whole cavalcade of champions. It may sound very loud to say, but we incline to agree with Ken Noe Jr.: Secretariat is the Horse of the Century. “He not only won the Triple Crown. He eclipsed the Derby and Belmont records and, as far as we are concerned, the Preakness record as well, since he was timed privately in 1:53 2/5 by Daily Racing Form. “In the Derby he ran a final quarter in :23 1/5 and set a mark of 1:59 2/5. In the Belmont, he smoked Sham over in a match, then really went to running. “His fractions were: :12 1/5, :23 3/5, :46 2/5, 1:09 4/5, 1:22, 1:34 1/5, 1:46 1/5, 1:59, 2:11 1/5 and 2:24. “Based on comparative times for the Belmont, Secretariat was beating Citation 21 lengths, Count Fleet 21 lengths, War Admiral 23 lengths, Omaha 33 lengths, Assault 34 lengths, Whirlaway 35 lengths and Gallant Fox 38 lengths. As Goldberg pointed out, Hatton rarely used the word “great.” But in terms of those who have ever written about horse racing, the word “great” certainly applies to Charles Hatton. In fact, the belief here is he ranks as the greatest of them all.